Longhorn Cows are the foundation of a successful Longhorn herd. Cows have very few calving problems because of a very elastic calving system. She has the ability to reproduce under less than optimum situations. Longhorn Cows tend to have a long breeding life with a short birthing period. She can be ready to start breeding by the time she is 14 months old and can have a calf about every 305 to 310 days. By the time a Longhorn Cow is 6 years old, she could have already given birth to 5 calves. Over time, she would give birth to an extra calf every 5 years. Even when conditions are rough, the Longhorn Cow is one of the few breeds that can produce a calf every year. She could possibly still be breeding by age 25. (The record for a Longhorn Cow to give birth is 33 years old.) Keeping Longhorn Cows as your breeding stock could feasibly give you, over a period of 20 years, up to 24 calves from one cow. This is more than twice as many as the average commercial or other breed of cattle. In the wilder, rougher areas of the country, losses of young livestock to predators can be problem for ranchers who have other breeds of cattle. These other breeds of cattle do not really have the ability to protect their young from danger. 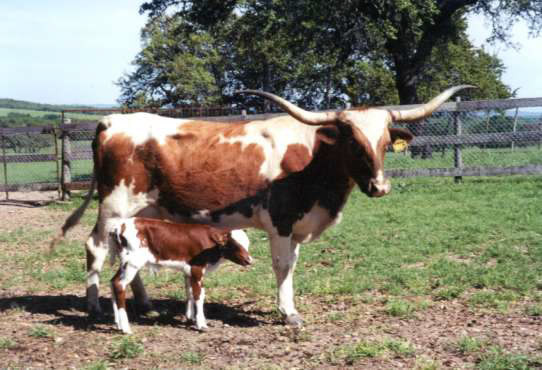 The Longhorn breed of cattle has the ability and will protect their young. This trait was bred into the Longhorn by many years of living as wild animals in the harshest climates and terrain in the country. They are known to join together to watch the young as the herd moves throughout the range and to take turns going to water. Longhorn cattle are resistant to most of the diseases and other health issues that other cattle breeds must be protected from through the use of expensive vaccines and medical treatments. The Longhorn Cow is smaller than the bull. She should weigh from 850 to 1150 pounds which reduces maintenance costs. Like the Longhorn Bull, her specific loose muscle structure allows her to travel greater distances over rougher terrain in search of food and water. Primitive conditions do not seem to cause any problems for Longhorn cattle. The ability to survive and reproduce is the most important characteristic your cows can have. Like the Longhorn Bull, the Longhorn Cow is very picturesque. Her horns are typically longer than those of the bull and make a photogenic twisty set. She also has a smaller body.